Detail of Demeter and Plutus from a painting depicting the tale of Leda and the Swan. The goddess Demeter, seated on a pair of cushions and holding a four-headed Eleusinian torch, is labelled "ELEUSIS", as queen of the Eleusinian Mysteries. 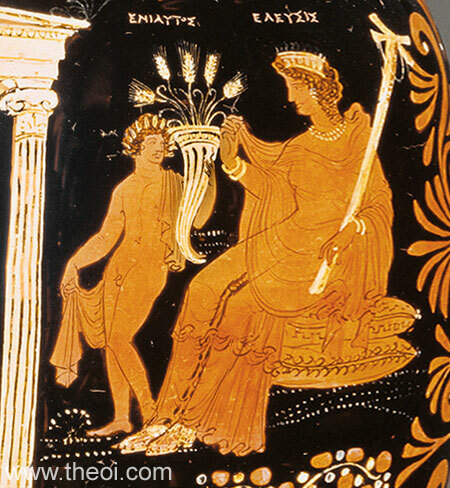 Her son Plutus, here named "ENIATOS" (Year), holds a cornucopia (horn of plenty) bursting with heads of grain.